AAA State of Play Blog: What is Poured in Place Surfacing? What is Poured in Place Surfacing? 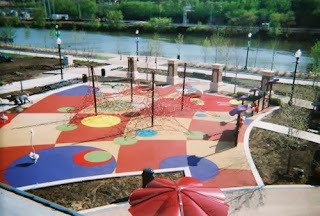 Poured in place rubber is a seamless surface that is poured in two layers to create a safe playground surface. The bottom layer is a cushion layer and is made of cushion materials; either buffings or chunk material. The cushion material is chosen specifically for the size and cut of the area. It is put in place at specific depths for proper fall height protection and bonded together with a predetermined urethane ratio. This layer is allowed to cure before installing the wear course. The top layer is called a "wear course" and is typically 3/8" thick and comprised of either EPDM (Ethylene Propylene Diene Monomer), a type of synthetic rubber, or TPV (thermoplastic vulcanized), which boasts superior color and longevity. The wear course is the layer that is seen. There are a few different options of poured in place rubber. You can determine the right one for your job based on fall height requirement, color options, UV stability needed, high or low traffic areas, and overall durability. Our representatives are very knowledgeable and can help you determine the right type of poured in place rubber for your project. There are many benefits of using poured in place rubber. It is a soft, yet durable, surface that will protect children while they play. It can be used both indoors and outdoors. There is a wide color variety with poured in place rubber. One of the coolest things about this surfacing is that you can create designs with it. Pathways can be laid in to guide children around the playground. Shapes, logos, designs, and other graphics can be put into the surfacing encouraging learning, games, and imagination. Sound can even be implemented into the surfacing adding an element of discovery and surprise. Below is a video showing how the surfacing is done!